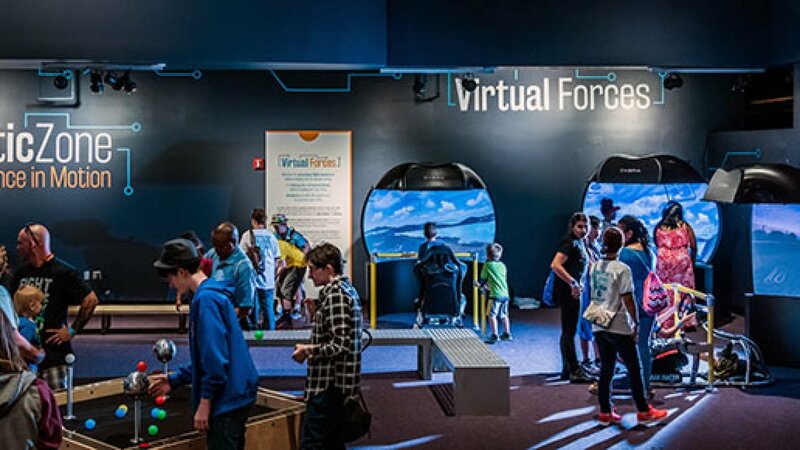 Orlando Science Center recently premiered a new permanent exhibit, Kinetic Zone, which uses interactive displays to encourage visitors to explore the fundamentals of forces, such as electricity, gravity, physics, Newton’s Laws and more. 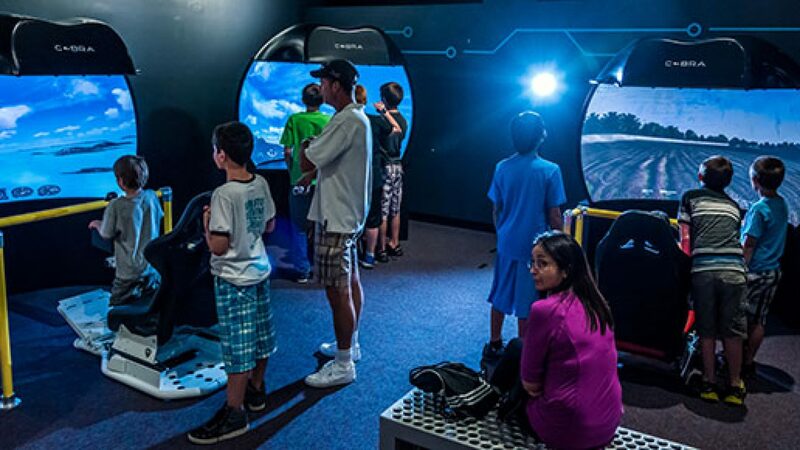 To illustrate how real world physics is interpreted in the virtual world, Orlando Science Center created an area featuring driving and flight simulators. Through the use of three Elumenati Cobra Panoramas attached to the simulators, visitors engage in an active exploration of the fundamentals of physics. The Cobra Panoramas provide an immersive experience that reflects real world rules and outcomes. Each Elumenati Cobra Panorama system features an Elumenati image generating computer and an Optoma EH500 projector (4,700 lumens, 1920×1080). Programming is based on Lockheed Martin’s Prepar3D flight simulation software and the Assetto Corsa racing simulation. Both platforms work instantly on the curved display using the Cobra’s warping software. 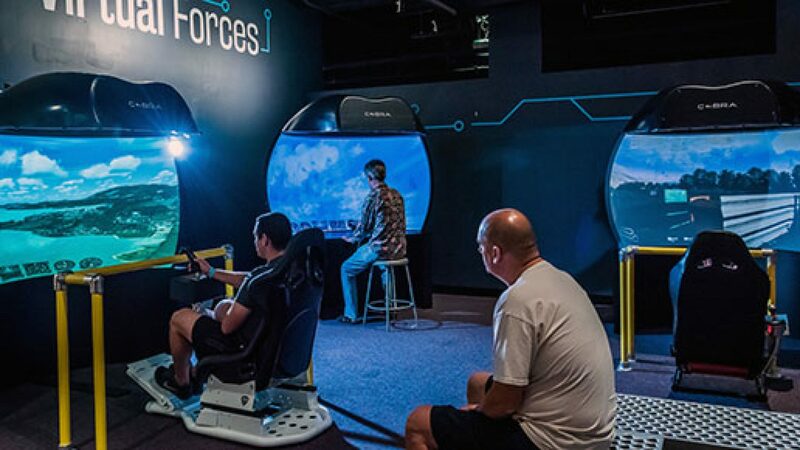 Whether it’s practicing flight maneuvers before hopping into an actual cockpit or testing out a structural design before building the real thing, simulators provide the opportunity to practice your skills. Two types of physics engines used in simulation are high-precision and real-time. High-precision physics engines calculate very precise physics. This requires a lot of processing power and does not allow for interaction. Research scientists and computer animated movies use this type of physics engine. Real-time physics engines, like the simulators used in Kinetic Zone, allow the simulation to respond to actions immediately. The trade-off is that for immediate response, the calculations have to be simplified, resulting in physics that are less accurate than their high-precision counterparts. The Cobra Panoramas enhance the real time experience, putting visitors right in the middle of the action. 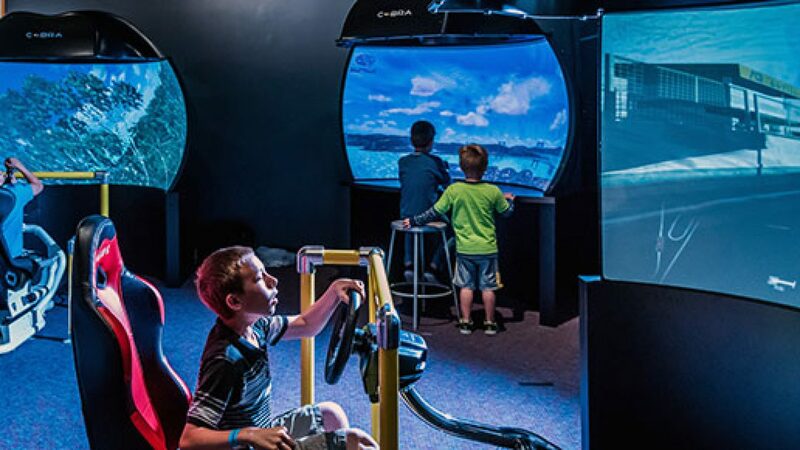 All the activities within Kinetic Zone provide hands-on experiences to engage visitors in active STEM learning. In addition to the simulators, there is a Coaster Challenge, which focuses on roller coaster engineering, and the Balance Challenge, where you test your creation’s balance on an 18-foot zip line. Other experiences include a pulley system where visitors can lift themselves off the ground, areas to build circuits and launch air rockets, plus a Bernouli table that uses air pressure to levitate balls in the air. Since its premiere on April 28, Kinetic Zone has been engaging school groups and day visitors alike. Designed for ages eight and up, the exhibit is appealing to a wide diversity of ages. The simulators and other displays are engaging parents with young children as well as teens and adults.